← One free trip to space or free international travel for life? Few days ago I received an email from my bank back in Spain, ING, suggesting me to take a small test in their website to see what my risk profile as an investor was. I was curious about what the result could be so I took it. Contrary to that statement I consider myself quite conservative in relation with my financial behaviour and that is why I save and invest the way I do. Nevertheless, it seems that the mainstream definition or perception of risk is quite different to the one I have. 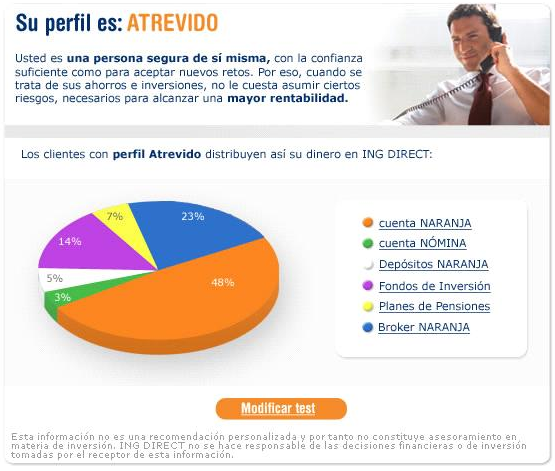 Together with the result of the test, ING showed a graphic showing the proportion of different financial products that people with “my” risk profile had… well, at least they got it right regarding the amounts I put in short-term fixed-income deposits, investment mutual funds and current account… the rest of them is quite different.